Obama’s Tokyo speech, delivered on November 14, 2009 at a glittering downtown concert hall gave a select audience the chance to savor the president’s trademark rhetoric, read aloud in now-familiar endearing tones, accompanied by slightly jarring Janus-like sideward glances, eyes darting back and forth between twin teleprompters. The best, if not the most sincere of the many tasty sound-bites offered up in his Yankee-will-not-go-home speech came early, almost haiku-like in brevity, befitting the recollection of a childhood memory. During a visit to the Amida Buddha in Kamakura with his mother, he was distracted by the green tea ice cream. In light of tycoon Thaksin Shinawatra's recent political posturing in Cambodia, which he used as a base to deliberately affront and humiliate the Thai government, all the while being accorded VIP treatment by Cambodian strongman Hun Sen, it is interesting to note that Thaksin's family company was already cutting deals and cultivating "friends" over the border back in the days when he was prime minister of Thailand. 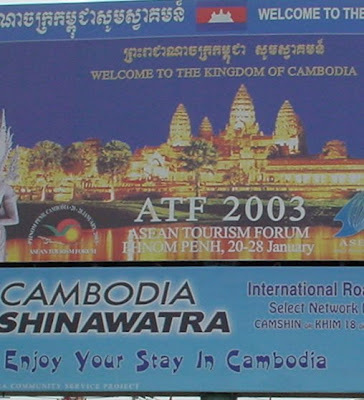 The juxtaposition of the two billboards slyly suggests that Shinawatra is, apparently on behalf of the Kingdom of Cambodia, welcoming visitors to Cambodia. Conflict of interest? 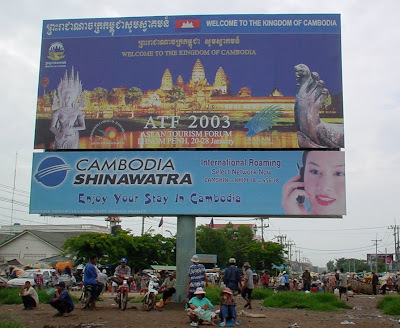 This photo was taken in Cambodia near the Poipet border crossing in 2003. A new piece on Swat/Waziristan/Baluchistan and the current Pakistani military operation is up at The Review. The true crisis facing Pakistan is not the Taliban: it is the rupture between the federal state and its constituent parts, and Islamabad’s refusal to accede to the legitimate needs and demands of its citizens in places like Swat and Baluchistan. It is a rupture, indeed, that is written into the very fabric of the state, and the reason why Bangladesh seceded from West Pakistan in 1971, after it was denied political legitimacy by the military regime and then brutalised by an oppressive army operation aimed at quashing any opposition. But the Pakistan Army learnt exactly the wrong lesson from Bangladesh: since 1971 it has been determined to move as rapidly and violently as possible against any sub-nationalist movement elsewhere in Pakistan. The spectre of Taliban conquering Islamabad and the state’s American-backed resolve to press on in a series of wars against its own people have effectively ended any chance for political consideration of the Baluchistan issue. Instead Baluchistan will be, once again, merely an empty badland where Taliban are hiding, waiting, plotting. It awaits yet another military operation. And we await another declaration of success.